Homology-directed repair (HDR) is a natural DNA repair mechanism that is induced by DNA double-strand breaks (DSBs). Site-specific TALENs or CRISPR Cas9-sgRNA complexes generate DSBs in the chromosome, leading to DNA repair. In the presence of donor DNA, HDR occurs and replaces genetic information in the chromosome with new information from the donor gene. Donor-mediated HDR makes many applications possible, such as precisely defined gene knockout, in-frame fusion tagging, transgene insertion, and introduction of base pair changes for mutagenesis or disease correction (Figure 1). Figure 1. CRISPR-Cas9-based gene engineering. A reporter gene and a selection marker are integrated into the targeted genome site via DSB-induced HDR from a donor plasmid. Two multiple cloning sites (MCS) for inserting homologous recombination arms (left and right). LoxP sites (optional) for convenient Cre-mediated cassette removal. The first type of custom HDR donor gene design and construction service is intended for HDR-mediated gene knockout (Figure 2A). These donor genes are designed in conjunction with our CRISPR and TALEN target sites and can be ordered from our CRISPR/TALEN genome-wide search page, available here. When you search for CRISPR sgRNA or TALEN targets for your gene, you will be presented with options for compatible HDR-mediated knockout donors. While not required for constitutive gene knockout, HDR donors do provide you with the convenience of being able to either apply drug selection or use fluorescence sorting for your knockout cells, which is especially important for cell lines with low transfection efficiency. Gene knockout HDR donors also enable you to define precisely the nature of the knockout mutation. The second version of GeneCopoeia's custom HDR donor design and construction services is intended for HDR-mediated knock-in applications (Figure 2B), which require an HDR donor and include 1) conditional gene knockout (flanking an exon with loxP sites for Cre-mediated inactivation); 2) gene mutagenesis (introducing specific base pair changes to either mutate a gene or restore a mutant gene to wild-type); and 3) gene tagging (adding an in-frame fusion protein gene tag to either the 5' or 3' end of a gene). Custom HDR knock-in donors require a custom quote, which is available by filling out the inquiry form. Figure 2. Two versions of GeneCopoeia's custom HDR donor clone design and construction services. A. Example knockout HDR donor strategy. An HDR donor containing both a drug selection marker (Puro) and a fluorescent reporter (GFP) is constructed. Drug selection or fluorescence sorting enhances the ability to obtain a knockout. Note: Only one allele is shown for simplicity. B. 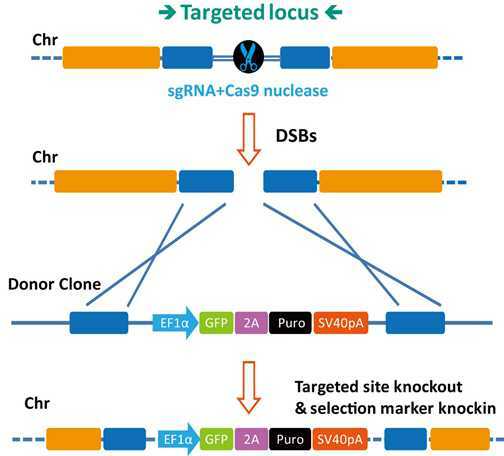 Example knock-in donor strategy for mutagenesis. Top: A donor with a single base pair change is co-transfected with CRISPR sgRNAs or TALENs. A drug selection marker (Puro) and a fluorescent reporter (GFP) are placed into an intron near the mutation site. Drug selection or fluorescence sorting allows isolation of clones with the mutated allele. GeneHero™ CRISPR products and services – GeneCopoeia offers CRISPR sgRNA design and cloning services, Cas9 expression clones and other related products and services for simple and fast targeted genomic editing. Genome-TALER™ TALEN and TALE-TF custom services – GeneCopoeia offers several levels of affordable custom services for designing, creating and validating TALENs, TALE-TFs and other TAL effector-based targeted genomic modification tools. Safe Harbor knockin kits and ORF clones. Easily create knockins of virtually any DNA fragment using our Safe Harbor knockn kits for human AAVS1 and mouse ROSA26. Search our datablase of over 40,000 Safe Harbor knockin ORF clones. Fast Fusion™ cloning kit – GeneCopoeia offers Fast-Fusion™ Cloning Kit to speed up your clone construction. Any PCR fragment can be cloned into your linearized vector in 15 minutes at room temperature. Up to eight DNA fragments can be joined together in a single reaction. Properly prepared vectors generate nearly 100% positive clones. There is no restriction site required at the junction site. The linearized vector can be generated by either PCR or restriction enzyme digestion. PCR products can be produced by either Taq DNA polymerase or other high fidelity DNA polymerase. Duo-luciferase HT assay kits and vectors NEW! Luc-Pair™ Firefly Luciferase HT Assay Kit (For High Throughput) NEW! Luc-Pair™ Renilla Luciferase HT Assay Kit (For High Throughput) NEW!